The Natural History Museum of Geneva celebrates the 20th anniversary of the first exoplanet discovery. 20 years ago, two astronomers from the Geneva Observatory discovered the first planet around a Sun-like star. 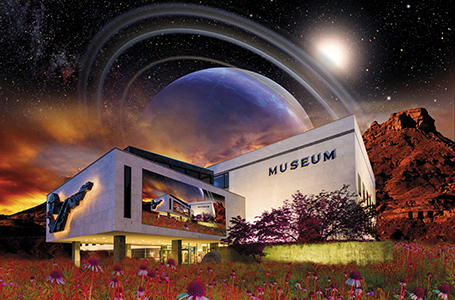 The Museum of Natural Sciences in Geneva, the university and the NCCR PlanetS decided to commemorate the event by organizing the largest exhibition ever presented by the Museum. Number of exoplanets discovered so far: 1850! Starting at March 21st 2015, the luminous display placed at the entrance of the Museum of Natural History in Geneva will immediately plunge visitors into a reality that was unthinkable 20 years ago: there are billions of planets outside our Solar System. It was in 1995 that two Swiss astronomers, Michel Mayor and Didier Queloz, discovered the first planet around a star resembling our sun. To commemorate this major scientific discovery, the Natural History Museum of Geneva has decided to build the largest exhibition ever staged by the museum, 1,000 square meters of experiences, explanatory modules, photos, videos, and of course, planets. The number 1850 will change for sure in the course of the twelve months’ duration of the exhibition, as the number of planets discovered is growing with advances in technology. In the last 20 years it has changed dramatically, a development that the museum also wanted to illustrate at public’s reach. How does one discover a planet? What aspects do they have? Are there some that look like ours? And finally, the ultimate question: is there life elsewhere? Visitors will discover that the first exoplanet was detected by measuring the gravitational influence it has on its star. It was the only feasible way astronomers had at that time to detect the existence of a faraway planet. How great was their surprise when they realized that it resembled Jupiter and revolved around its sun in only four days, while our own gas giant needs over eleven years to do the same. Consequently, 51peg b, as it has been named, is extremely close to its star and is reigned by an infernal heat. How a gaseous planet could form so close to a star and survive a furnace of over a thousand degrees was a mystery for researchers at that time. They would experience a lot of surprises in the years to follow with the advent of new techniques, each time more sophisticated. They will gradually discover giant planets, very light or very heavy, planetary systems with up to six planets, super earths (non-existent in our solar system), ocean planets or very hot planets. But what interests the astronomers above all is searching for planets similar to ours and if possible in the habitable zones of a star system. While «Jupiters» and «Saturns» represent the vast majority of extrasolar planets discovered to date, the smallest, like our Earth, are still very difficult to find. Some of the most efficient instruments for detecting exoplanets are developed and built in Geneva. A good example is HARPS, a state of the art spectrometer, that allows us to detect planets down to the size of Neptune (17 times the radius of Earth), by measuring the velocity of its star to 1 m/s. This successor of ELODIE, the instrument that allowed Michel Mayor and Didier Queloz to discover 51 Peg b, definitely increased the worldwide reputation of the Geneva Observatory. It also inspired the European South Observatory (ESO) to want more. ESO has asked Geneva to construct a super spectrometer capable of detecting Earth-like planets residing in the habitable zone of their star system. ESPRESSO is its name, and will be ten times more accurate than HARPS and will be installed on the giant VLT telescopes in Chile’s Atacama desert. Switzerland is also the architect of CHEOPS, the first satellite designed and built in the country. CHEOPS, whose mock-up will be displayed to the public, will characterize the planets discovered to date. With CHEOPS detecting a planet is only the starting point, it aims to characterize it further, and to determine its nature which can be gaseous, liquid, rocky, with or without atmosphere, etc. In short, it should be an exhibition that will let a visitor dream about other worlds while keeping him or her on Earth with respect to the difficulties and challenges imposed by such research. A workshop related to the search for exoplanets will be offered to children every Wednesday afternoon. In two hours, we will try to explain with a model and simple measurements that there may be a habitable extrasolar planet outside the solar system. How to find it, what are the conditions for it to be habitable? In other words, the idea is to discuss with them the possibility of extraterrestrial life. The exhibition «Exoplanets» is organized by the Museum with the participation of the University of Geneva and the NCCR PlanetS, and with the financial support of the Wilsdorf Foundations, Wright and Moser.